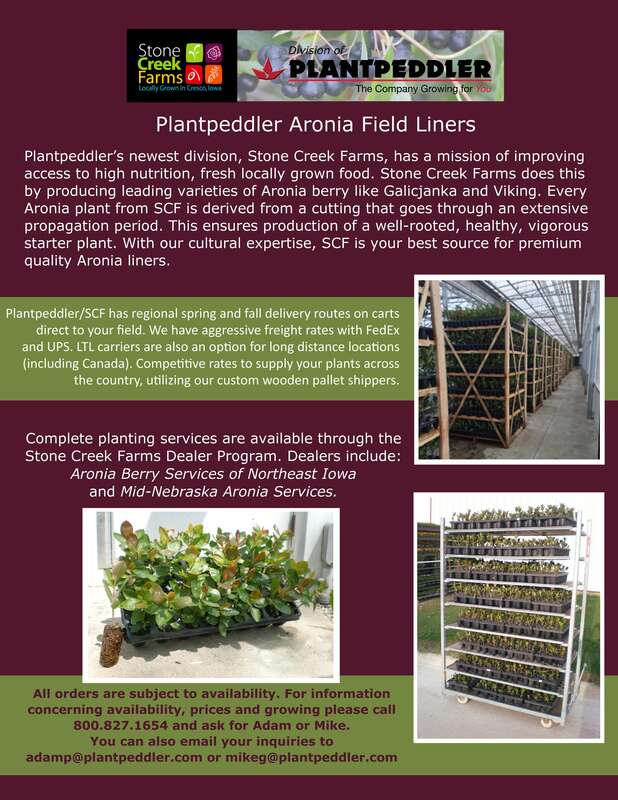 As Plantpeddler’s newest division, SCF focus is multifaceted including creating a new revenue stream to balance seasonality of the ornamental product lines and divisions. Opportunity to provide area population with fresh locally grown produce with higher nutritional value and food quality. Increases sustainability of production practices, improves year-round facility utilization, stabilizes seasonality impact to staff. For 25 years the company has marketed to the grocery segment, SCF is an extension of these relationships. Five market niches have been identified and are being developed. As the division matures, a core component of the production will be Plantpeddler grown, with seasonal and specialty products produced by other local producers. SCF will use its marketing, processing and distribution expertise to increase market opportunity and income. Call us at 800.827.1654 for our current availability! Click here for more information on the Aronia Berry. Aronia Berry the Super Berry ready why here?